Inside the box was a book. A most unusual book, indeed. Its cover opened the wrong way ’round, it was at once a book of paintings and of the written word, and all about a subject near and dear to our hearts – bookstores! 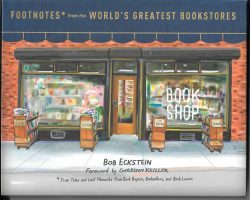 The title: Footnotes*from the World’s Greatest Bookstores by Bob Eckstein, Foreword by Garrison Keillor, *True Tales and Last Moments from Book Buyers, Booksellers and Book Lovers. You may ‘know’ Bob Eckstein as a New Yorker cartoonist or as author of The Illustrated History of the Snowman. You may even know this book which was published by Clarkson Potter in 2016 and landed immediately on the NYT best seller list. Garrison Keillor needs no introduction. Nyel and I spent the next few afternoons sitting side-by-side on the couch, taking turns reading aloud each double-page spread on the 75 bookstores included in this delightful book. 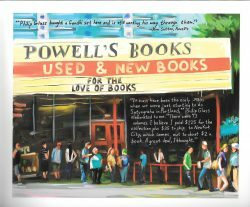 We had not been to all that many – Powell’s in Portland and Elliott Bay in Seattle, of course. Shakespeare and Company in Paris, Harvard Book Store in Cambridge, and (maybe) the Brattle Book Shop in Boston. Moe’s in Berkeley and City Lights in San Francisco were old stomping grounds for me and since Nyel has never been to either, that might be our first trip. How right Sue was! Each page just calls out. “Come visit! 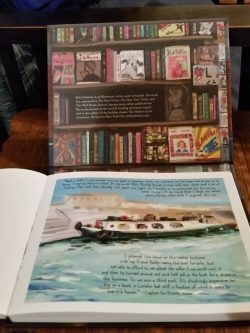 Come browse!” And, too, it made me think of favorite bookstores not included – places I hadn’t thought of in years like Foyles in London and Blackwell’s in Oxford. Time to re-visit those, too. When we owned The Bookvendor in Long Beach we used to say that giving a book is giving a present that can be opened again and again. This particular book, however, gives you the pleasure of planning journey after journey with entire bookstores to visit along the way there and back again! What could be more pleasurable? Great idea, Sue!